If you enjoy the contemporary sounds of Kenny G, this recording is for you! 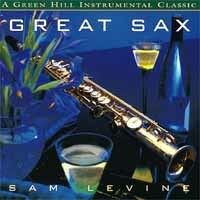 This instrumental recording showcases Sam Levine's talent with sleek 1990's production and pairs him with master producer Jack Jezzro. Available on compact disc or cassette [$9.95 (list: $10.95)]. If ordering the cassette, the price will be adjusted upon receipt of your order but will not be reflected on your program-generated receipt. Also available as part of a 3 Volume set, Dinner Music Romance Collection, at an extra special price.